WordPress, Script Writing, Memoirs – What does this have to do with fiction writing? It’s been a strange week. Whenever I get toward the end of a project, I sabotage my progress by finding distractions (or I let them take over “There, I said it.”). I honestly don’t want my story to be over. I’m madly in love with my latest protagonist, Braxton Valentine. Valentine: Steel Heart will be launched Oct 31 as part of a new Amazon Kindle World – Desiree Holt’s The Phoenix Agency. This will be book 1 of 2, with the second installment coming in Feb 2018. I don’t have to say good-bye to my brooding hero, but that doesn’t make it easy to finish book 1. I wanted to have a free schedule for the holidays, not like last year where I wrote like a mad woman for a January release. Never, never, never again. That’s the goal, but in the midst of my mounting common sense comes my new website design. Distraction #1 – I asked my designer, Maddee at Xuni, to create a WordPress site I can maintain by myself to keep the cost down on monthly tweaking and all the new releases. I’ll be launching it soon, but I had to teach myself much more than I ever thought I would know about WordPress (WP). Like a petulant child, I kicked and wailed against doing it NOW, but I eventually broke down WHILE I WAS FINISHING Valentine’s story. After I sunk my teeth into my learning curve, I found I really enjoyed getting to know more about WP & I’m thrilled that I will finally have control over my site. I still plan on using Xuni for some administrative functions. I can’t totally quit Maddee and need my fix, but it was satisfying to learn something new and gain control at the same time. Distraction #2 – Since I saw the end of my project in sight (we’re talking final chapter, big finish, folks), I decided to make contact with a local writers group and attend one of their critique sessions. 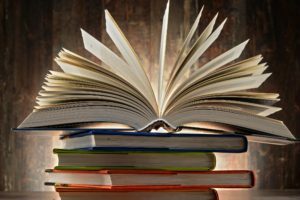 I enjoy giving back to the writing community, as other authors have done for me, and I also get a lot out of reviewing and giving feedback to others. The meeting was held at a good restaurant I like, double score, and I met new people, trifecta. But after lunch we began the critique process (which hasn’t changed in YEARS), which is to read 10 pages aloud (cold) and provide feedback. Instead of hearing submissions of fiction, I heard only one memoir and one screenplay/script before I had to cut out. In the past, this group has also had quite a number of poets. Not one fiction read. I have to say I was a little disappointed, except that I wanted to make the most of it and focus on how screenplays can still evoke emotion with good dialogue and setting. 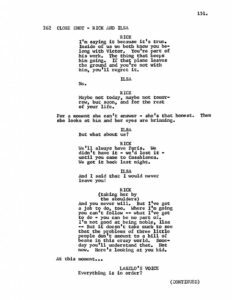 The next day I researched script writing and read examples of famous scenes from well-known movies that were packed with very emotional content. It inspired me to double my efforts to put the right dialogue into every scene and fill it with emotion. The setting can still be sparse (especially when I am writing shorter Amazon Kindle Worlds these last few months), but the dialogue needs meat and heft. The film-goer or the reader MUST be gripped by your stripped down version of a story and their minds fill in the gaps to paint a picture in their minds that can be rich and satisfying. Have any of you thought about script writing? 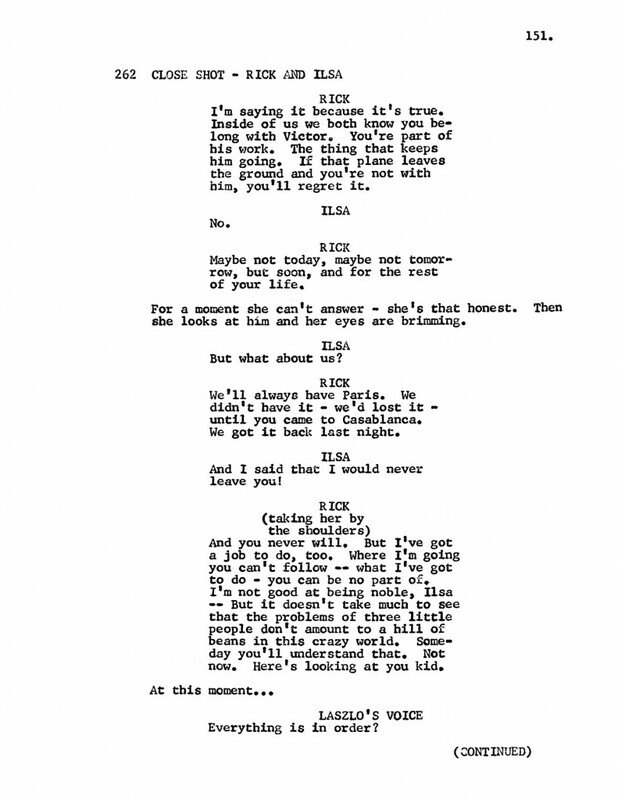 A rule of thumb – one page of a script is equivalent to one-minute of film/TV. So if you can write an approx. 50-70 pgs for episodic TV or 80-120 pgs for feature film—with good and effective story structure, packed with emotion and good dialogue—you have the bare bones to a solid novel. I’ve heard of some authors who start out by writing in a script fashion before they fill out their story into fiction. Could this be the new outline? Here’s a page from CASA BLANCA – We’ve all seen this scene. I’m not proposing that I divert all my attention to learning script-writing, but this method isn’t that far off from where I taught myself to write a tight scene with a focus on dialogue. To get a jump on my writing after work, I would take a notepad to lunch and write only dialogue lines that I heard in my head (yes, I had a lot of folks staring at me). With those lines as a framework, I would fill out the other elements later (setting, body language, action, introspection). The brain is an amazing team player. While you are doing other things, it is still working on your story or your research. If you’ve ever read a full script, you know how the brain fills in the gaps and makes you see a movie rolling in front of your mind’s eye. So my “fiction group” diversion lit a fire under me. I suppose inspiration can come at you fast. Even the Memoir writer in the critique group got me to shred through the words that readers will skim (as Elmore Leonard said) to realize that even your own memoir needs emotion and a point. Unless you are famous, who is your target market? If you’re a survivor of an ordeal, you can share your journey and be inspirational, but your average person who only wants to chronicle their life will have a “story” with no end (yet) and a ramble of back story and mental musings without a point. My dad’s memoir is a case in point. It shall never see light of day because he can’t stop editing it—which is a good thing because he’s still here to wordsmith it. 1.) What diversions have paid off for you as a writer? 2.) Have you ever considered writing a script for your book – or started with a script and fleshed it out into a novel? 3.) How many of you maintain your own website? Do you enjoy WordPress? 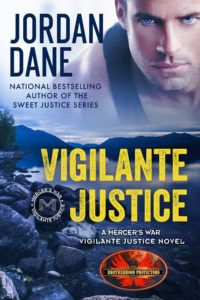 In Montana, when a disturbing pattern of missing teens and college students falls under the FBI’s radar, former CIA operative Mercer Broderick fears the violent abductions are at the heart of a dark web of conspiracy that must be stopped and Brotherhood Protectors won’t be denied from the fight. This entry was posted in #amwriting, #writetip, advice for fiction writers, Writing and tagged film, Jordan Dane, memoirs, screenplays, script writing, TV, wordpress by Jordan Dane. Bookmark the permalink. Sometimes diversions are helpful if they don’t divert for long (can’t say I’ve mastered that). When I returned to writing in 2005, I returned to it in the form of script-writing at the encouragement of a friend. While I think it’s good to know how to write in a number of forms, it just never grabbed me. But as you mentioned, it does form a sort of teaching tool because you do have to hone the story down and nail the dialogue. And kudos to you for learning more about managing your website. I started out a little under a year ago taking some web design courses but I found I couldn’t stay engaged enough to stick with it. However, I need to get back to it because, like you, while I don’t mind having someone else do the heavy lifting on my website, I’d want to be able to manage the day to day on my own. Thanks for your comments, BK. When I was more active in this group & they were overrun with poets, I made the imagery of poetry work for me. I suppose I filter everything through my writer glasses. On websites, you might consider a WORDPRESS design. I found it intuitive but TKZ uses it here & I’ve been familiar with it on a few occasions. Once you get the content moved over (& I recommend you do that on your own with maybe a spot check from your designer when you’re done), you can easily maintain it with your updates. Moving content is your classroom. 1) Yes, now that I think of it, there were diversions that inspired my writing. Watching Facebook profile or my writing teacher Menna van Praag and her 1-minute writing courses inspired me to follow her idea to take the first sentence of one of her best-selling novels and write a page of a story of my own. After writing this first page and getting positive feedback from Menna, I wanted to know how that story continued. In the end, it became a novelette, which I self-published and which got many downloads and great reviews. 3) Yes, I do maintain my website by myself. But my page is hosted by a great company who also help me with more tricky parts of my website design. However, the content change is done completely by me. Thanks again, Jordan, for this article. It generated some contemplations which go very much in line with the book which I prepare now for publishing on writing craft, or rather a motivation book for writers. It can be daunting but my webdesigner has been a good teacher. They designed the framework navigation & added only minimal content so I could see how it worked, but I did the painstaking rest of it. It’s taken me nearly a week to bring content over & add links to book covers (& other content) for over 15 years of activity, but I’ve learned a lot. That’s great news about the judge’s comment on your contest entry. People geared toward scripts can recognize the qualities of good pacing/structure & effective dialogue. I like it. Thank you very much, Jordan! I operate my own WordPress website. I use the free version but have my own domain name, rather than a .wordpress.com. I find WP to be a great platform for what I need and recommend it to anyone looking to have their own website. After recently finishing a short story it was beta read by a screenplay writer (Dene Stark) who liked it so much she asked if she could use it as a screenplay. The finished result was quite an eye opener compared to my original. Comparing the two gave me an appreciation of the skills involved and also made me look at how I write differently in terms of structure, scene setting, description, etc. I’m about to write Part Two of the story and I’m looking forward to putting some of this new-found knowledge into practice. Yes, I highly recommend WP too. If you buy your domain name, it can mimic a regular website and WP is free. I started out with blogger, but the link always had ‘blogspot’ in it or some other added wording that gave away you are on a free site. Many big named authors are using WP and their navigation is beautiful and it fits to mobiles too. I wouldn’t want to start from scratch. It’s worth having someone knowledgeable set things up, but well worth it for maintenance. I’m glad to hear you got to see your short story turned into a script. That says a lot for your writing and storytelling ability. You can learn a lot by the process and it sounds like you have. Good for you, Dave. Thanks for your comments. 1. Get clear about the difference between using wordpress.com and hosting your own site using wordpress.org. 2. (My preference:) Avoid website hosts that give you an easy to build, but proprietary site. Chances are you’re going to want to move your site at some point, but since it’s virtually impossible extract your material and design choices from their proprietary system, you’ll need to start from scratch. This is a big advantage of WordPress. 3. Understand what a theme is, how you choose a theme, what it means to make a child theme (modify an existing theme to come up with one more to your liking) vs choices you have within a theme (such as changing colors or font). 4. You probably want an expert–or near expert, not just some kid who messes around with it–to work with you on choosing a host and creating the site, including choosing and tweaking your theme. 5. Understand what’s involved in having someone build you a theme from scratch. -how to manage sidebars and widgets. Don’t panic. With today’s WP, most of these tasks are straightforward, with short learning curves and no programming. I’m not going to say this is a complete list. But it covers a lot of what’s involved. How much time will this take (talking about getting the site going, not “bringing content over” and maintaining the site)? Once you find the right “expert” to work with, and assuming you’re doing this full-time, I would say somewhere between two and five days, depending on your experience and how your mind works (how you learn this kind of stuff, not how “intelligent” you are). Having said all this, remember the basic tradeoff is between saving yourself some money versus focusing on your main comparative advantage, which is probably writing. Great tips, Eric. I was just thinking how much my designer has on her plate, even with me maintaining content. In the long run it will save me lots of money, but it’s nice to have a tether to someone I’ve trusted over the years and think of as a friend. Thanks for taking the time to provide your list. Amazing stuff. Thank you. 1. Diversions can lead to ways to solve problems with the WIP. Since I also write nonfiction, I’m happily surprised how often I’m asked to do an article that ties in perfectly with my current novel. Working right now on a suicidal teenage character who rides horses (about which I know zip-squat). Out of the blue, I get a request for an article about a teenage barrel racer (who thankfully is not suicidal). Suddenly the horsey details drop right into place in the novel. Synchronicity and serendipity are all over the place if you’re open to them. 2. Loved your comment about using dialogue as an outline to be filled in with details later. Works for me. 3. Thanks, Eric, for your suggestions. Eric’s point #2 is why I chose WP over other options that probably would have been easier to DIY. I used a pro to build my WP.org site and maintain it myself, but keep it VERY simple. If I want to try something new, the pro sets it up while I sit beside him and watch. I can’t recreate what he does, but it gives me a tad of insight. He’s very helpful about warning me of pitfalls (like, if you install plug-in X, it might conflict with widget Y). He is also a writer who lacks grammar and punctuation knowledge, so we swap skills. I edit for him, he fixes what I screw up on my site. As you say, Jordan, having a safety tether with the expert is vital. I love your collaboration with Eric. Thanks for all your comments, Debbie. Good stuff. Screenplays? Never gave them more than a “nope, not for me” thought. WordPress. I migrated over there several years ago. I paid a designer to set things up with the understanding I could do updates, etc., but when it comes to coding, I turn the reins back to her. I like the control, but I like the safety net knowing she can handle the trickier stuff that I have no inclination to learn. My blog is also with WordPress, so I get lots of practice using the interface. Like you, I don’t need to be a WP expert but it’s great to have a safety net. Thanks for your feedback, Terry. Always appreciated. I’m not up to the point of having an “author website” yet. But my day job consists of creating, maintaining, and doing all of the associated website and social media stuff along with all of the advertising brochures, emails, and such. Caregiving is very hard & often takes precedent over anything else if it’s vital. I have issues with this too & have learned to ask for help from my wonderful siblings or push back on things that aren’t critical. But I’m pleased to hear you are still writing & have found other ways to express your creative side. All that helps to achieve balance. Good for you. Thanks, Penny. I see you out there, Penny, and I notice. HA! Working with other writers, editing, and mentoring are diversions from my writing. But it’s all good because I love doing those things and always learn new tidbits to apply to my own writing. I recently pledged to myself to dive back into working on my unfinished novels and another book project from now until the end of this year. With fewer distractions, I hope to make significant progress. As for WordPress, I’ve been building and maintaining websites for my editing business, my defunct aromatherapy business, my more spiritual musings, and, until they recently migrated to Facebook, a local writing group. I find it easy to use, and I love the control I have over when and how I add posts, add pages, or change themes. I do, however, have a website guru who takes care of verifying and installing WordPress updates, doing the backups, hosting my sites, and anything I manage to break or that will take too much time from my work. And I agree with Eric, especially on #2 and #6. I have to say, WordPress gets easier to use the more you take control into your own hands. I’m sure you’ll enjoy creating new excitement for your books on your website, Jordan. Thanks for the encouragement, Suzanne. I also LOVE hearing about you delving into your old manuscripts. I recently did this too and I found a gem I had forgotten about. After clearing off my deadlines for Amazon Kindle Worlds, I will dive back into this one without a deadline. A tip on setting aside work to do later, I had already completed a detailed synopsis to set up a proposal. That makes a great outline to pick it up later. Have fun and thanks for chiming in. Thanks for the great tip on getting back into the story on abandoned novels. Well, not so much abandoned, because I do think about where I left off all the time. But it’s been a long while since I’ve done more than edit the completed chapters. So, yes, it’s time to have fun and get back into the flow. I love WordPress and find it really intuitive. I’m working on building my own site now after doing many for clients and my volunteer groups. Your comments about how much you love your hero was a good lesson too. My hero and heroine have life and are moving about and saying things, but they’re not yet fully realized to me and it’s evident on the page. I’m discovering more and more about them as a write the first draft and am making revision notes like crazy. Tell me I’m not the only one who doesn’t totally animate her characters until the second draft (or later)…. I love that you write a sparse story. You’re only a step away from formatting it into a script if you have a solid plotting structure to keep the turning points moving the story with pace. I don’t write in drafts. I have a rolling edits process where I keep a daily word count goal but edit my daily writing every night & update in the morning before I get my word count in. I edit the same section while moving forward until I think I can roll on. I think you’re missing the character development, journey & growth by only having dialogue. Some introspection adds a sense of journey & growth. That’s just my two cents. Thanks for the food for thought, Sheri. Jordan, I wrote screenplays for years and actually managed to get one produced. I’ve since turned to writing novels—at least I can publish! The main thing I learned from screenwriting is getting the beats right. They really help with pacing and help to drive the story forward in a way the reader expects—similar to movies. Hope that helps. I’ve heard of beats, but don’t know enough about what that means, except that I think of it as turning points and spots to pick up the pace/stakes. You have given me something else to research. Thanks for doing that, Steven. Congratulations on your screen writing victory. That’s huge.